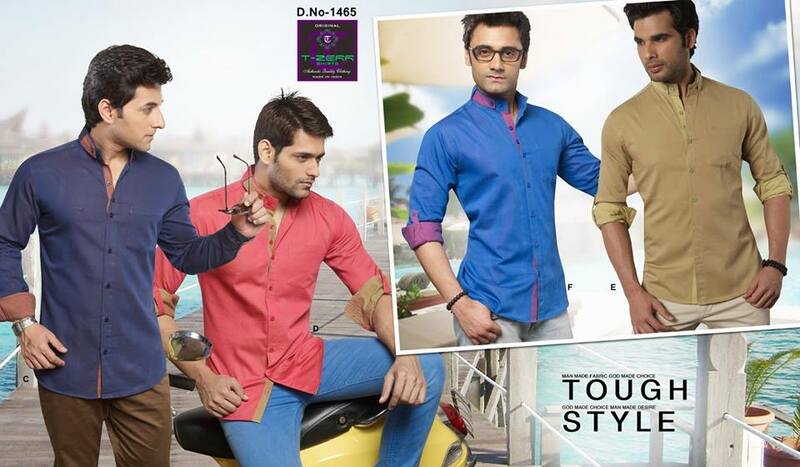 Casual Shirts in Surat, India from T-ZERR LIFESTYLES PVT. LTD.
T-ZERR LIFESTYLES PVT. LTD. Established in the year 2016 as a Private Limited firm. We,“T-ZERR LIFESTYLES PVT. LTD.”, are a renowned name, which is engaged in manufacturing, trading and exporting a wide collection of excellent quality Shirts. Our specializations are Casual Shirts, Club Wear Shirts, Formal Party wear Shirts , Linen Shirts , Half Sleeves Shirts, Smart fit Shirts, Check Shirts, Plain Shirts, Vertical stripes Shirts, Horizontal shirts, Solids Shirts, Oxfords Shirts, Chembray Shirts, Party wear Shirts and we also Handle Order Based Shirts . This Shirts are manufactured by our professionals using excellent quality fabrics and threads that are procured from the authorized composite mill vendors of the market. Infrastructure plays an important role in the success of an organization. At our company, we have established a world-class infrastructure with More then 35000 Square Feet Area and facility that encompasses machines and equipment that are based on the modern and advance technologies. Furthermore We have hired a team that comprises of knowledgeable and experienced professionals, who strive hard to keep up with the quality standards and complete the several requirements of our valuable clients. We are proud to have marked our presence all over the globe, including European, Asian and Middle East markets. Further, Our Shirts are designed & developed as per the latest fashion trends & styles. These casual wears are highly appreciated among the clients for their attractive designs, color-fastness, optimum tear strength, skin-friendliness and comfort ability. T-ZERR LIFESTYLES PVT. LTD are engaged in Manufacturing superior-grade Shirts with international quality standards. We are exporting our quality products to South Africa and Saudi Arab, UAE, Pakistan , USA , UK and Many other Countries and our Products are Much Appreciated for its Quality and Style. We are a Private Limited Company, enjoying an unmatched reputation, under the incomparable leadership of Mr. Vikrant jain with industry experience of More then 15 years in fabrics and magnificent market knowledge of our leader constantly inspires us to come up with more enhanced quality and products that that cater to the exact clients’ demands. More than 300 STYLES with COLORS readily available. ALL 100% COTTON	SIZES AVAILABLE - M , L , XL , XXL PLEASE NOTE:- (1) We are Manufacturers and not Re sellers (2) THIS ALL DESIGNS ARE FROM LATEST CATALOGS. (3) MINIMUM ORDER QUANTITY ALLOWED IS 200 PCS. (4) M.R.P 695 to 995.INR (50% TRADE DISCOUNT) (5) ADDITIONAL DISCOUNT STRUCTURE WILL BE ACCORDING TO QUANTITY AND PAYMENT. (6) ALL SIZES ARE COMPULSORY IN A SET.